The Kingstown Multi-Purpose Centre held its 2006 graduation at the New Testament Church of God, on Wednesday 28 June, 2006 under the theme “Technical Education enhancing the skills of the Nation”. to get side-tracked by negative things. “You must have a vision”, he said. The anxious graduates collected their certificates with expressions of relief on their faces. 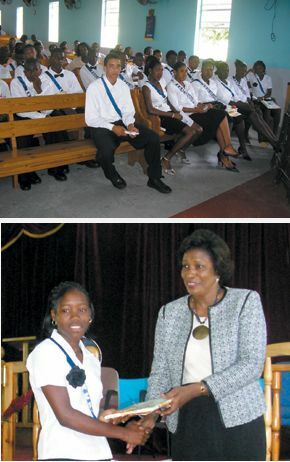 There was also a prize-giving ceremony, which saw two girls standing out in different areas. Niteshia Craigg took the Prize for Best Information Technology Student and Most Outstanding English Student Award.. The Most Outstanding Female Award however, went to Alearna Cupid, who also took the Best Hospitality Award. Other graduates and students also received numerous awards. His Excellency Sir Fredrick Ballantyne and Lady Ballantyne were in attendance, along with Chief Education Officer, Susan Dougan, and other Ministry of Education officials.